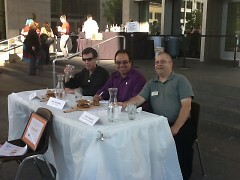 I was one of the judges for the final judging of Grandwich 2012. This article gives my reflections, including a video analysis with a special "day after" epilogue. 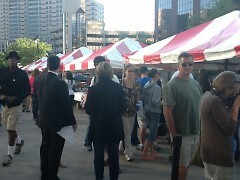 Friday night, I spent my time in front of the Grand Rapids Art Museum at the Grandwich final judging event. Last year and this year I tried every single Grandwich offering. That means I had tried forty-five or so Grandwiches. This year, I was invited to be a judge for the final top ten competition. I got to sample the top ten vote-getters and then watch a gaggle of people try samples of the top ten during GRAM on the Green. I have to admit that I was a little disappointed: nobody else on that stage had tried as many Grandwiches as I had. The final selection was also a disappointment for me as it was not even in my top ten best. "Who judges these things?" I wondered. As it turns out, this year the answer was "Me!" Like last year, I jumped on the Grandwich competition right away, tried all 29 Grandwiches in five days, filmed them and shared them in articles on The Rapidian and my Facebook group EatGR, and then went on about my business. Only a few days after that did I get an email from Mark Lewis, who was working on the Grandwich committee, and get an invite to be a judge for Grandwich based on my enthusiasm for the event. Fast forward to this year's event on August 17. I got to take my position at the judging table with John Gonzalez of Mlive, and Torrence O'Haire, otherwise known as The Starving Artist. Gonzalez is clearly a dedicated foodie and O'Haire is a local chef with solid credentials. Any doubts that I had that the judges weren't serious about this event were quickly washed away. 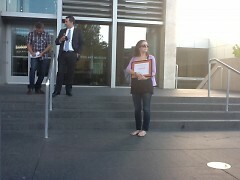 The rules of the competition were explained to us, and off we went. For the most part we were served full sandwiches so that we could both eat them and pick them apart, which we all did with gusto. We wanted details! We wanted to know what everything was and where it came from. We knew that we had to try 10 of these, but it was a little hard to pace yourself at times. When you had a sandwich you really liked, you had to remind yourself to save it for later because you needed to give nine other a fair shake. We didn't really talk to each other much at the time about how we were voting. Just the occasional comments about something being particularly good, or something that was clearly amiss. We noted with respect the comments of our peers, but nobody pushed a concept or steered somebody to a choice. We were on our own, and it was great. Ultimately, our votes were tallied. 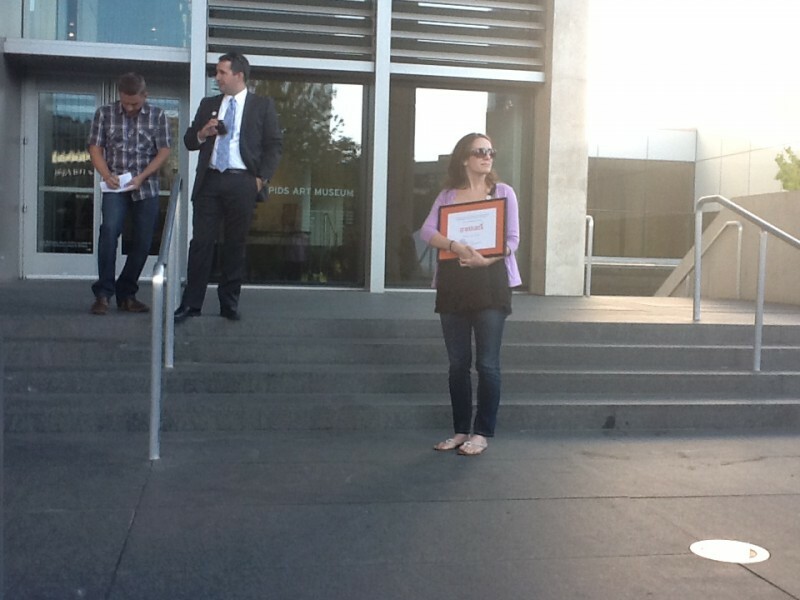 The winner, The Skywalk Deli, and the runners-up were announced. You could tell that the owner of Skywalk was sincerely moved that he had won, and I felt fantastic knowing that one-third of that decision was mine, but 100% of the success belonged to the restaurant owner and his staff. As the Grandwich crowd started to recede to other events near the GRAM, I pulled aside O'Haire and asked him what he thought about the results. As it turns out, despite our different backgrounds and approaches to the judging, we both felt that the top three, including the pair tied for third, were pretty much where we had individually voted them to be. I do have to admit that I am happy to hear this, not because I believe in "groupthink" or required any validation- it was just great to see that two people from completely different backgrounds could come to the same conclusions. If eating all of the Grandwiches next year is what it will take to get to the judging table again next year, I am up to the task. I wouldn't trade my Grandwich judging experience for anything!